Hu Jia goes back on ‘trial’ in a few hours where it is expected he will be handed down a sentence of up to five years in prison based on two interviews given and six unspecified blog posts most of which were written during the more than one year he spent under house arrest. Charging Hu with state subversion is proving as difficult for the legal process as it is for Chinese premier Wen Jiabao; when asked directly last month, during one of the most public appearances Wen gives each year, about Hu Jia's situation, the response Wen gave sounded to many like a denial that any ‘dissidents’ had even been arrested. Playing Captain Kangaroo may work in Zhongnanhai, but the reality that Hu and Zeng and their supporters have chosen to live in goes more like a Kanye West song. When Hu was first kidnapped around this time two years ago, Zeng Jinyan started a blog on which she documented the bureaucratic games she saw being played as she ran around Beijing trying unsuccessfully to find out what had happened to her husband, who was dropped off miles from home and with no notice over a month later. When Zeng herself soon became subject to constant surveillance, she slammed on the brakes and started getting in their face. Placing Hu under ongoing house arrest in 2006 effectively put an end to the environmental protection and AIDS awareness work for which he had already become quite well-known, and so trapped at home with little more than an internet connection, he not only created a whole new approach to activism, which some are calling Tiananmen 2.0, he switched gears to become a social worker of sorts, enabled by technology to keep constant track of a whole range of cases, and where possible, enabling others [zh] to do the same. 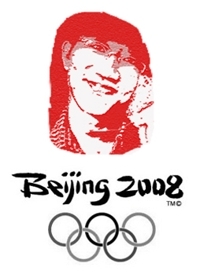 In 2007, Zeng Jinyan was chosen by TIME Magazine as one of the most influential people in the world. This will no doubt go down as a landmark moment in Chinese history, but to this day anyone looking to China's largest search engine for more information needs to be prepared for disappointment. 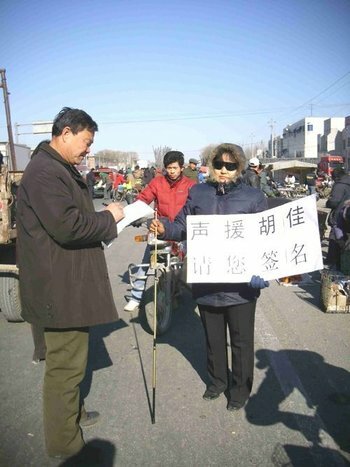 In the China of today, though, someone like Hu Jia just doesn't quietly disappear, and when state agents abducted him again last December, near-blind family friend Zheng Mingfang went straight to the streets and did what she could, walking up to strangers and explaining Hu's situation, collecting signatures for a petition calling for his release. Early last month, however, Zheng too was arrested. On Facebook, there are Hu Jia support groups. There's a cause. Hu Jia and Zeng Jinyan spent months filming their would-be captors for a documentary, Prisoners in Freedom City. After Hu was abducted a second time in December last year and not quickly released, someone got hold of a copy and put it online, and not just in one place, but several. Following Hu Jia's arrest late last December, when it came to appear that his and Zeng Jinyan's newborn baby's health was at risk, enough momentum grew out of scattered online chatter that a group of netizens tried to force their way up to Zeng's door to deliver milk powder. When that proved unsuccessful, someone thought it through, and got it right. And still others went on to try. Hu Jia kept it simple; in preparing posts for his blog, he did interviews over Skype, then sometimes sent them out over e-mail as .mp3 attachments. Clearly there were things he could have done better, but shortly after his arrest we saw the formation of a Netizen Party, with clearly stated intention to stick to using the highly encrypted services offered by Gmail and Skype. One of the first things the authorities did in December last year when Hu was taken away and Zeng placed under house arrest, where she remains today, was to cut off her internet connection and confiscate her phones. Despite this, Zeng's blog kept on getting updated. And supporters kept translating it. The second she got her cellphone back, Zeng started sending out photos. When Hu had his first day in court, we saw drive-by vlogging. Zeng's even managed to release a podcast. Wen Jiabao almost seems justified in denying that any activists or netizens have or are being detained, given all the networks of bloggers out there so equally resolved not to accept it. If the bogus charges against Hu do somehow end up being dropped today, we only have more of ingenuity in blogging to look forward to. If they don't, and Zeng and her daughter remain captive to their squadron of nosepickers, didn't China finally launch 3G networks this week? It won't be long before we'll see a House Arrested Beijing channel on Qik.com. 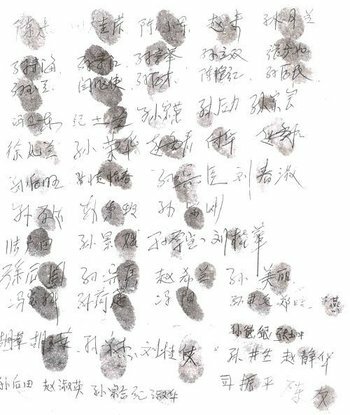 Speaking of which, a post this week on Zeng Jinyan's blog says that Hu's trial at 9:30 a.m. on April 3 in courtroom 23 at Beijing #1 People's Intermediate Court will be open proceedings, and Zeng intends to be there. Now I write this poem for you, my Love, my Lady, my Wife. Even tonight, the stars glitter in the cold sky of apparent isolation. Glowworms yet appear and disappear among the shrubs. to bid her farewell. I was compelled to embark on a long journey away from home. I entrust to you, my warm kisses on our daughter’s cheeks. Please let our child touch the herbs beneath the stockade. She will experience my deep love for her. Please play the Fisherman’s Song every time you water the cloves. I should be able to hear the song, my love. Please take good care of our silent but happy goldfish. Hidden in their silence are memories of my glamourous and turbulent youth. But let me reassure you: I have never stopped singing, my Love. The leaves of the roadside willow tree have gradually changed colour. Some noises of melting snow approach from afar. Noises are engulfed in silence. This is just a very simple night. When you think of me, please do not sigh, my Love. The torrents of my agonies have merged with the torrents of my happiness. Both rivers now run through my mortal corpse. I would have returned to your side, my Lady. I can do so only with a redeemed soul after these times of testing. China is a legal country.It’s true to sentence Hu Jia of up to five years in prison.